Before we get started though, we HIGHLY RECOMMEND you watch this video. It paints an incredible picture of how Chinese High Speed Rail has grown in the space of 10 short years! Pretty incredible and powerful stuff, right? China is a big country, after all. The high-speed rail network in China connects big towns from all 4 corners of the country, connecting families, friends, and businesses. 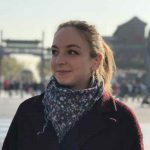 A ride on China high-speed rail won’t be cheap – but it’s one to tick off your list at least once during your time studying, travelling or working in China. China High-Speed Rail – As efficient as you’d wish for! Newly-built passenger-dedicated rail lines designed for electrical multiple unit (EMU) train sets traveling at not less than 250 km/h (155 mph) (including lines with reserved capacity for upgrade to the 250 km/h standard), on which initial service operate at not less than 200 km/h (124 mph). The China high-speed rail (also known as HRS) is the world’s largest high-speed rail network, and the most extensively used. It stretches throughout the country, going through 30 out of the 33 provinces that make up China. The total length is 27,000km (17,000 miles) which makes up for about two-thirds of the world’s high-speed rail network. And it just keeps growing! There are 3 different classes of the Chinese bullet train. C-Class, G-Class, and D-Class. This service, operating above 250km/h is considered a HRS. These are intercity train services, operating for example between Beijing – Tianjin. This line was designed with a speed of 350km/h and sees on average speeds of 226km/h. ‘G’ for… Gaotie! 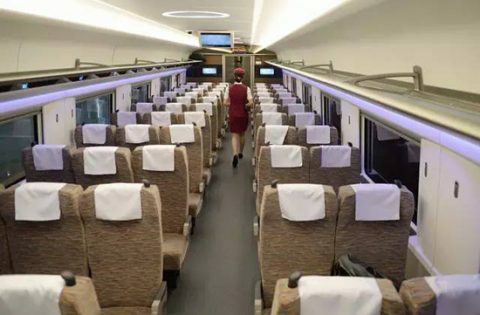 One of the most common types of high-speed rail in China, this service runs at a minimum of 250km/h on average. It usually runs on lines with designed speeds of 350 km/h and averages around 300km/h depending on the line. Pretty speedy…! ‘D’ for..- Dongche 动车, another term used to refer to a type of high-speed rail in China. These services run at lower speeds and run either on the high-speed or non-high speed track. 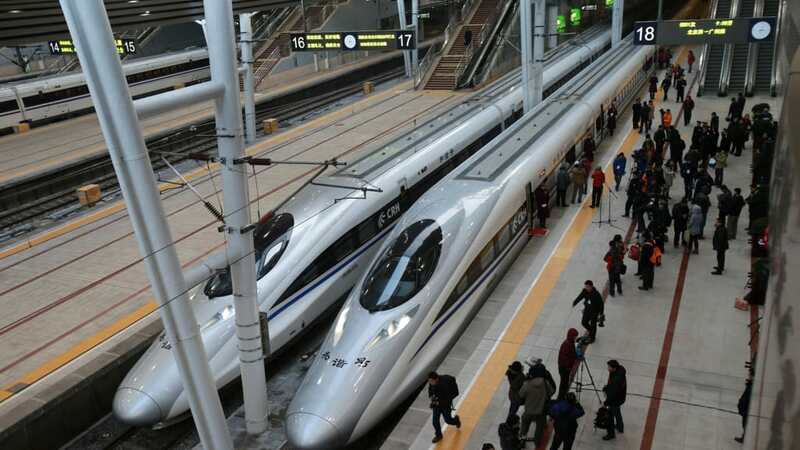 China High-Speed Rail: How Fast is the Chinese Bullet train? China high-speed rail speeds can reach 300 km/h (186 mph), or a top speed of 350 km/h (217 mph). 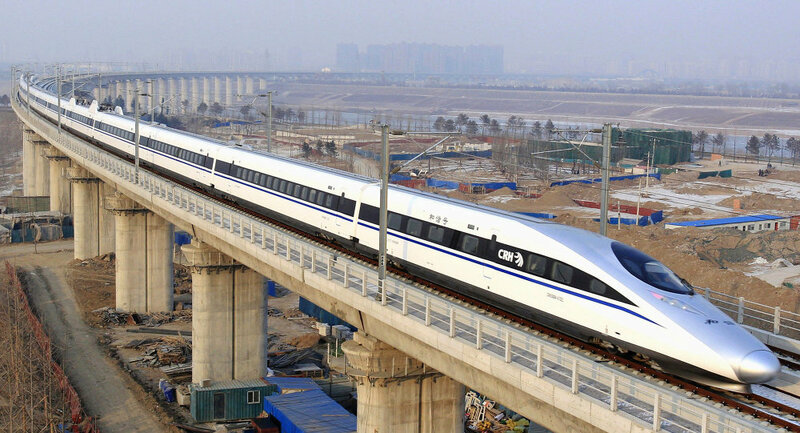 The fastest China high-speed rail train service is the Shanghai – Maglev Train. This is measured by peak operational speed. This train service can reach a massive 431 km/h (268 mph). However, the small length of the track means that the average speed of the train only makes it to 245.5 km/h (152.5 mph). Why should I travel by China high-speed rail? There’s only one thing that should put you off travelling the HRS rather than a slower train or bus, and that’s the price. The Gaotie is not cheap, but it’s often worth it. There are a few classes to choose from, but even at second class, the cheapest class, it’s pretty darn comfortable. There’s a large amount of space – much more than on an aeroplane, and you can walk around freely. Smokers should be warned that unlike on the slow trains, smoking is not allowed on the high-speed rail. Join the large group of Chinese males that will be standing at the door coming into a station to get a quick 30 second puff if needed! China High-Speed Rail: Where can I go? 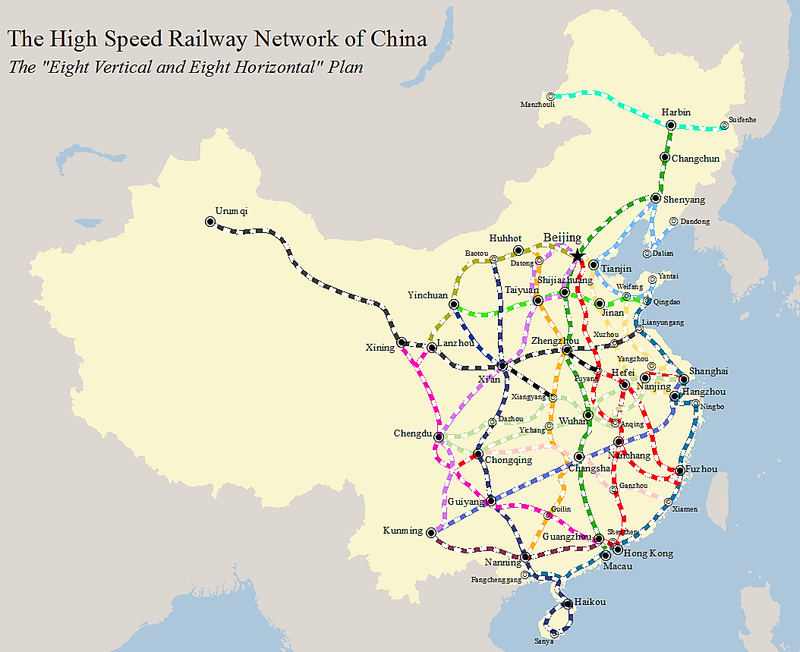 Keep in mind (if you watched the above video you’ll already know this) – but China’s High Speed Rail Network in 2008, consisted of just TWO LINES! The network is constantly expanding and improving. You can go to 30 out of China’s 33 provinces on the fast train – not leaving much else to explore!